If you enjoy keg beer, then you certainly understand the ecstasy of having it cold 24/7 in your home bar. However, the question becomes, what is the best kegerator for the money? Because these keg cooling appliances are not cheap, you’ll want to make sure you get the most bang for your buck. A good kegerator will keep your beer fresh for as long as possible and consistently dispense it at its highest quality. If you don’t mind dispensing just one draught beer at a time, you can save quite a bit by getting a single tap kegerator, but you can get dual or even triple tap ones for a full on home bar experience. You can also choose between full sized ones or minis that are both meant for indoor home use. The former comes with a pressurized CO2 tank and is free standing on the floor, while the latter is self-pressurized and sits on a countertop. In our continuous search for a reliable kegerator we came across a few that are good for home use and perform reliably without breaking the bank. If these options aren’t enough, Amazon has quite a few more! If you’re more of a wine drinker, we have also reviewed good wine coolers for the home! And if keeping a few snacks and a mix of cans and bottles cold is more your requirement, we have reviewed the best compact fridges too. This commercial-grade unit comes with superior-quality American made, NSF approved components that include a premium draft tower, handles, faucets, and hoses. You can get either a single tap kegerator or a dual tap one. The special design also features protective floor plates that shield scratches and harm to your floor surface and pressure gauge rolling casters that permit excellent mobility. A high quality 5-pound brewer-preferred CO2 cylinder is included (which you will have to fill before using) to ensure proper carbonation and a professional pour. Since this is a full size kegerator, the single tap unit can support standard 1/2 or 1/4 kegs and the dual tap unit can handle a full-sized standard half keg (Sankey standard or two 1/6 kegs). Although it comes set up for pin lock kegs, alternatively, Cornelius kegs can be fitted with the aid of a special ball lock connection. However, it is important to keep in mind that the Edgestar full size cannot hold Coors keg, Miller rubberized or other comparable oversized kegs. According to most customer reviews, the Edgestar has been described as an outstanding and fantastic kegerator. This is because the kegerator is able to keep your beer good and cold and can even be reset to an even colder temperature setting lower than the factory setting. The unit also has an excellent foam ratio and operates very quietly. The unit’s superb make is another added bonus. According to a few reviewers, the temperature can sometimes fall too low resulting in freezing hoses. With a capacity of 4.6 cubic feet and a weight of 87.6 pounds, the Nostalgia Electrics KRS2100 is a single tap mini-kegerator that features four heavy-duty swivel casters that help in moving it around the clubhouse or anywhere else that you want the party started. It is the most affordable of the full-sized ones of its standard too. The unit’s exterior features a black finish that blends with most décor. On the upper sidetop of the machine is a 13-inch semi-gloss chrome tap tower, and a corresponding guardrail. A detachable stainless steel drip tray parks underneath the tap prevent a mess. Also, the KRS1200 comes with a Sankey D system that employs a spring-loaded method to tap draft beer. In addition to these features, the KRS1200 comes with a 2.5lbs CO2 tank, which is large enough for four 15-gallon kegs. The kegerator also holds one ¼-barrel pony size keg, one full size ½-barrel keg and two five-gallon D-system kegs. A duo meter regulator is also part of this unit and it helps in adjusting the pressure of the carbonating gas. This kegerator also functions as a normal refrigerator when you slip in the two wire shelves contained in the box. The KRS2100 is a capable and probably the best kegerator for the money. It also comes with all the accessories necessary for you to start taping your beer. Unlike comparable models, however, European beer kegs and other non-standard kegs do not fit inside it. Also, it is impossible to tap two different draft beers simultaneously even though it can hold two kegs at a time. The unit takes a considerable amount of time to assemble and if not done properly, the faucet can clog or become loose and fall. If you like choosing from several draught beers with each of them being perfectly chilled, buying a well-designed almost commercial kegerator is an excellent idea. The Kegco K309-B digital kegerator is one of the most electrifying new models in terms of price, capacity, and performance and it is one of few triple tap units available for the home. This model comes with an ultra-precise digital thermostatic control that allows more accuracy unlike mechanical thermostats. In addition, the Kegco K309-B digital display presents actual cabinet temperatures in real time. The easy push button on the control panel interface makes it effortless to adjust the temperatures. While most kegerators are faced with the challenge of maintaining stable cold temperatures, this is a non-issue with the Kegco K309B-3. This model delivers some of the iciest beer you will ever have. This is because the unit features a ground-breaking “fan-forced” cooling system that apparently generates some of the coldest temperatures. The fan also ensures that air is sufficiently and uniformly supplied in the storage area. Moreover, the unit comes with a “deep chill” mode that allows the machine’s compressor to operate on a nonstop mode 24 hours. Once the desired temperature is attained, simply press the deep chill button and the machine recommences the on/off cycling to save on energy. This is no wimpy appliance and in fact is probably the best kegerator for home use if you’re a true draught beer fan. The Kegco K309B-3 features a spacious cooling cabinet to house 3 full sized kegs, ponies and other keg types like Miller kegs, Coors Kegs and rubber kegs. The unit also comes with a durable 5 lbs aluminum Co2 tank, quality CO2 regulators, thermoplastic vinyl and fittings, and a classy D system lever handle keg coupler that is compatible with the Sankey Keg. When not being used for kegs, it can be converted to a regular fridge by inserting the two included trays. Designed with a glossy black finish and a stainless steel door, the Versonel VSL155TDSS Kegerator is one of the top rated kegerators in the market today. This model comes with an enhanced digital LCD temperature display that allows you to keep your beer temperatures at optimal levels. The stainless steel exterior provides an elegant and fresh look to your home bar area. The unit is compatible with different keg types, including the ¼ barrel, 5 gallon D system, and the 1/2 barrel full size keg. The unit also features casters for easy mobility. Other great features include temperature adjustment (ranges 34 degrees-40 degrees), CO2 tanks stores, chrome guard rails to house the tap, and a drip tray unit. It is easy to use, however, the tap can pour more foam than beer depending on the pressure. Some reviewers have also cited a problem with the in-door thermometer. 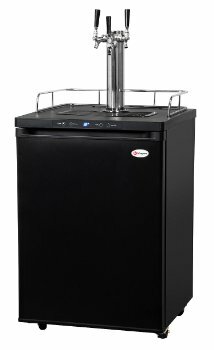 Of all the counter-top small kegerators, this model reviews among the best entry level machines. Designed to operate solely with Heineken, Heineken premium and Newcastle Brown Ale, the KRUPS and HEINEKEN B100 maintains beer at the ideal temperature of 37.4 degrees Fahrenheit and an LED display shows you the current temperature. This unit also discharges CO2 every time the tap is open to ensure that your beer stays fresh for up to thirty days. The unit’s BeerTender Peltier cooling system offers steady and reliable cooling, to keep the 5 litre capacity unit at the ideal temperature. Its simple design also makes it easy to operate. Other features of the B100 include a removable draw spout and a detachable tray for easy cleaning, 5 non-reusable draught keg tubes, and an authentic tap. DraughtKeg and Beertender maintains beer fresh for up to 30 days after tapping. The ultra-quiet and effective Peltier cooling system offers constant and reliable cooling of the keg but you might need to pre-chill the keg for at least ten hours prior to putting it in. It is limited to only to a few beers named above.